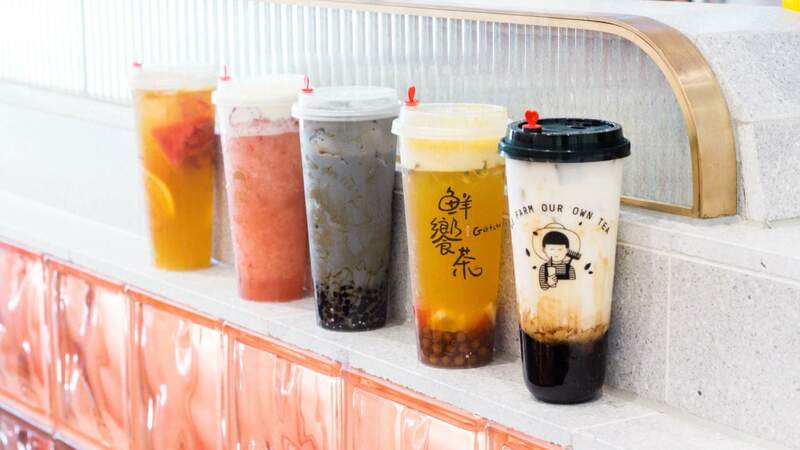 Melbourne's bubble tea franchise Gotcha Fresh Tea is rapidly expanding, having just opened up shop on Elizabeth Street. It's the brand's fifth Melbourne store — since launching in June 2018, they've popped up at Flinders Street Station, Springvale, Keysborough and Glen Waverley. Gotcha stands out from the pack thanks to its teas, which are all exclusively grown and hand-picked on the Gotcha plantation in Taiwan — the country where bubble tea originated, mind you. The extensive menu goes deeper than your average bubble tea shop, too. Milk teas come in red bean, bamboo charcoal, taro and durian flavours. Fruit teas come with sliced fresh fruit, including lychee, passionfruit, cumquat and mango. They all range from $5.60–6.40. There are also teas available with cheese, salted egg or tiramisu foams; a range of 'healthy' collagen teas in bamboo, aloe vera and mulberry flavours; and a menu of macchiatos, lattes, health teas and smoothies to choose from. Of course, you can add pearls and jelly to any and all flavour combinations. Gotcha's expansion is no where near slowing, either, with over 15 stores slated to open in 2019. A Footscray store is currently in the works, along with eight additional stores across Victoria as well as many more around the country.